A graphic adaptation of the iconic novel by Bram Stoker featuring the familiar tale of Jonathan Harker’s strange journey to the castle of Count Dracula and the evil doings of the Count in England. 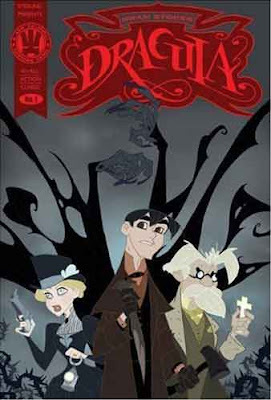 ALL-ACTION CLASSICS: DRACULA is a wonderful adaptation that will surely appeal to younger readers. I know many kids find the original novel daunting because of the archaic language, but through the use of the comic medium, where art and text share the storytelling, this classic literature becomes accessible to a wider audience. There’s nothing new or clever in Mucci and Caldwell’s use of the medium, which is a good thing in this case. The simple panel layouts,;clear, easy-to-follow text placement; and careful combination of pictures with words all work in service of the story and result in an engrossing read. The art is not as gothic and gloomy as many adaptations; it’s more colorful and, as the title suggests, action-packed. It reads like an animated cartoon and I found myself marveling at Halliar’s colors – I have never thought of Dracula as a colorful story, but his reds and blues and purples and yellows are perfectly suited to the tale and help to turn up the volume of the story. This is a character-driven story and Caldwell has created memorable visual representations of the classic Dracula characters. I particularly liked his dapper Dr. Seward, the Twain-esque American Quincy Morris, the deadly beautiful Brides, and Dracula himself, who looks nothing like Bela Lugosi. The violence and bloodshed are kept to a minimum visually, but of course, it’s a horror story, so sensitive readers may find it difficult. This is a great introduction to the original that will hook younger readers immediately. After reading this version, it would be great to read the original and then compare and contrast. Which parts of the novel did the writer of the All-Action version choose to include or omit and why? Where did the writer and illustrator allow the pictures to convey information in place of text? You could have students choose a single page or panel of this graphic novel and match it to the page or pages of text from which it was adapted. The novel is presented as a series of diary entries and letters. Students could discuss how the graphic adaptation varies from this format and how each version might affect the reader.